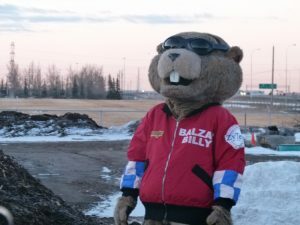 Every February, the BBCA’s mascot, Balzac Billy, comes out of hibernation and pokes his head out of his burrow at Blue Grass Garden Centre, to tell Balzac area residents how many more weeks of winter to expect. To welcome Billy from his hibernation, the BBCA hosts an annual Groundhog Day Breakfast. The annual Groundhog Day Breakfast has become a special tradition for Balzac area residents. The first recorded contact with Balzac Billy was in 1978, by CFAC radio. Merle Osborne, the original handler of Balzac Billy would give the annual predictions over the phone while serving a breakfast at the Balzac General Store. In 2004, the BBCA hosted its first official Groundhog Day Breakfast at the Balzac Community Hall. In 2011, the breakfast was relocated to the Blue Grass Garden Centre to accommodate the growing crowds.